vInspired's Cashpoint gives you the power (and the money) to bring your own community project to life. Tell us what great change you want to make and how your project clearly benefits others. We'll give you up to £500 to make it happen. Our Loud and Proud Grants are now open. Currently, these grants are only accepting applications for LGBT+ projects. They will be opening up funding to other types of projects soon. vInspired will help you every step of the way! 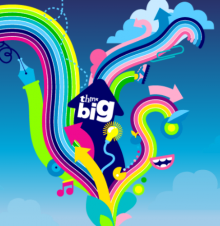 O2 Think Big is for people aged 13 to 25 years old with ideas which will help make things better in their local community. The award is for £300 plus training and support and it may be possible to apply for further funding if a project is going well. UnLtd currently run a number of programmes which help individuals develop project ideas within their local community. The programmes are focused on creating social change, and UnLtd provide a range of different grants and supports depending on the project. There are also additional programmes for people looking to develop projects within 'Big Local' areas. Deadlines: Decisions are made every three months. The Alec Dickson Trust supports young people (under 30) in the UK who want to use volunteering or community service to set up something new in their community. The Trust provide grants of up to £500 to individuals or groups of young people aged 30 or under, to help them put their ideas into action and run projects that benefit the lives of others – particularly the most marginalised and disadvantaged. Support and encourage youth volunteering. Benefit disadvantaged communities and individuals, addressing a specific need. Improve communities and ideally are innovative and try to do things a bit differently e.g. using social media creatively or using existing resources in new ways.